This page provides you with Director Of Engineering resume samples that you can use for inspiration in writing your own resume, or for creating one through our easy-to-use resume builder. Below you'll find our how-to section that will guide you through each section of a Director of engineering resume. You are the Chief Engineering Officer of your company, or you aim to be it. You think you have all the skills to be the senior executive responsible for creating practical solutions for an improved standard in the company, executing specific plans and designs in tangible materials. You are responsible for the technical supervision of the development, production or operation of an engineering project for a multinational corporation, a major company or a government institution. All of this, but...you also believe your resume could be better. 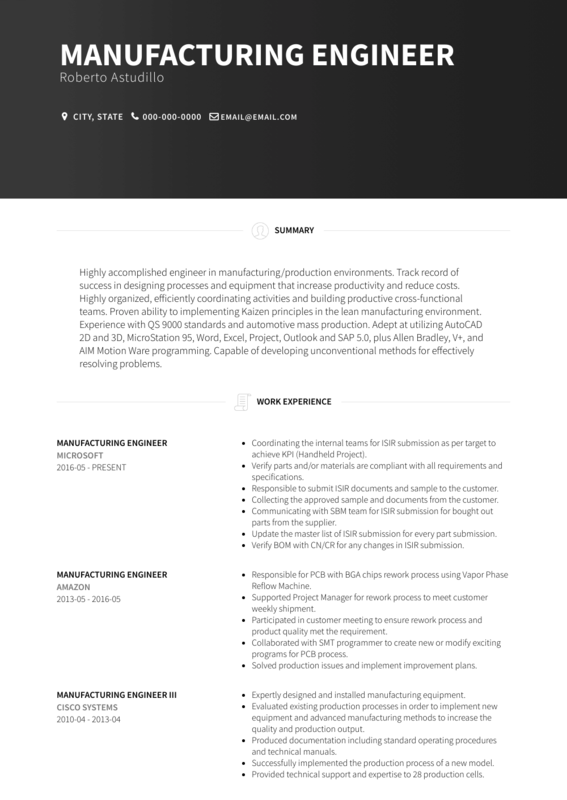 Don’t worry though, if you are looking for the best Chief Engineering Officer resume sample, you have come to the right place. We have helped many professionals in your industry get to the next level and we want you to be next. Let us inspire you like we inspired 3 million people all over the world. How to Write Director of Engineering Resume? Crafting a strong ChEng resume is important. You probably think this section is not really needed.You have a portfolio of projects you can just show to impress the recruiter, convincing you’re the best person for the job. What should be added? Well, your recent work history for a start. What positions have you worked at recently and what sort of experience did that provide you? These things must be added simply because it’s showing a recruiter why they should pick you. What is more, the history of your employment could allow a recruiter to say for certainty you’ve got the experience to work as a ChEng in their organization. Tell them what qualifies you as a ChEng. If you need more tips on writing the best work experience section for a great Chief Engineer like you, check out our detailed resume guide. Thanks so much for your time: you now have access to standout Director of Engineering resume sample: if you are also looking for resume templates, you should check these masterpieces we have been working on here : many professionals like you have successfully used it to take their career to the next level.